A week full of lavishness, Intense Outfits and High end drama just wrapped up for me after India Couture week (ICW 2014) came to an end yesterday at Taj Palace , New Delhi ! It was an Eye candy to watch High fashion fitted outfits, worthy of making a red carpet appearance made to fit to" T" molded onto the curves of the feminine body of those Hot models, down to the last measurements . As usual, some were fancy enough to keep me on a lust watch until they filter down the market for me to buy ,while some were just passable enough for me .I would be sharing my love for the best couturiers with their chic and progressive designs who really kept me wanting for more and more ! Day 3 saw designer Monisha Jaising bringing out her magic in her collection and then there was something to suit everyone . I met Monisha for a formal dinner just a few days before the show and I gotta tell you that I haven't seen a designer more grounded and subdued with a warm heart as hers ! She is truly hospitable and brought about a cool sense of energy with her kind words and friendly nature. 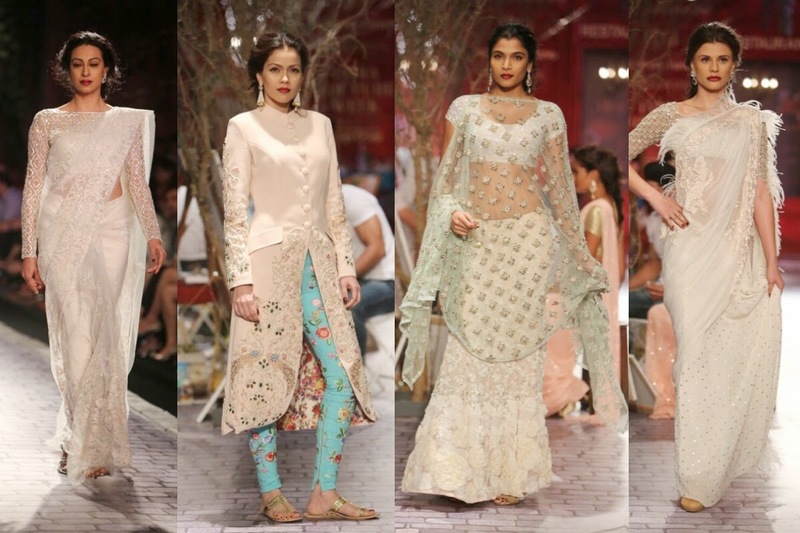 Monisha Jaising collection was based on her theme" World Bride " I literally loved this idea . A world bride is a destination bride, the one who is on a go , and is supposed to take her vows anywhere and in any part of the country ! She looks out for a fuss free clothing at the same time still wanna look her best and feels luxurious ! The stage opened up recreating a cobbled Paris street , with a roadside french cafe and portrait makers . French painters wearing typical french style caps were painting the models portrait. In between the trot, the models would pause and be the muse for the painters ! A modern bride doesn't necessarily have to wear a Sari, and with that being thought, their was an appearance of Sari gowns to woolen Sherwanis with printed leggings and fitted corset gowns in kanjeevaram madras silk which had a perspective Indian touch .The feathered Saris in ivory and structured embroidered Kurtis in luxe fabrics and gold coiled fitted blouses, were the main highlight of her collection . 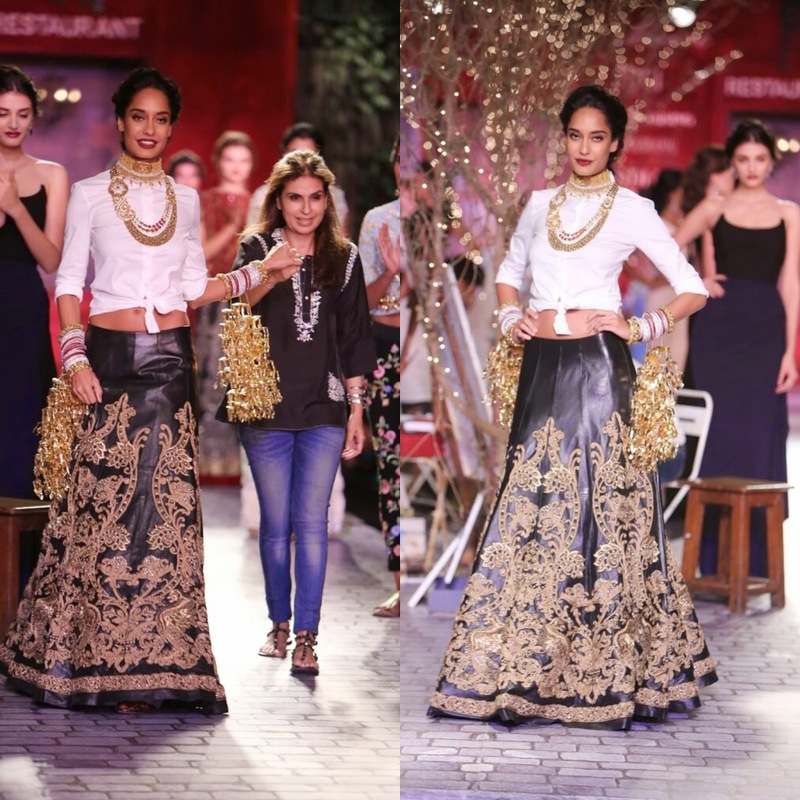 The music suddenly turned from Pop to our desi Indian wedding shehnai and the showstopper Lisa Hayden walked the ramp wearing a heavy gold embroidered Black Leather lehenga and a Knotted white collared shirt looking like a ,most sought after traveler bride in a "Chuda" and hanging gold kalire ! Never thought black could be so much fun to wear to a "Shaadi" (hindi for wedding). 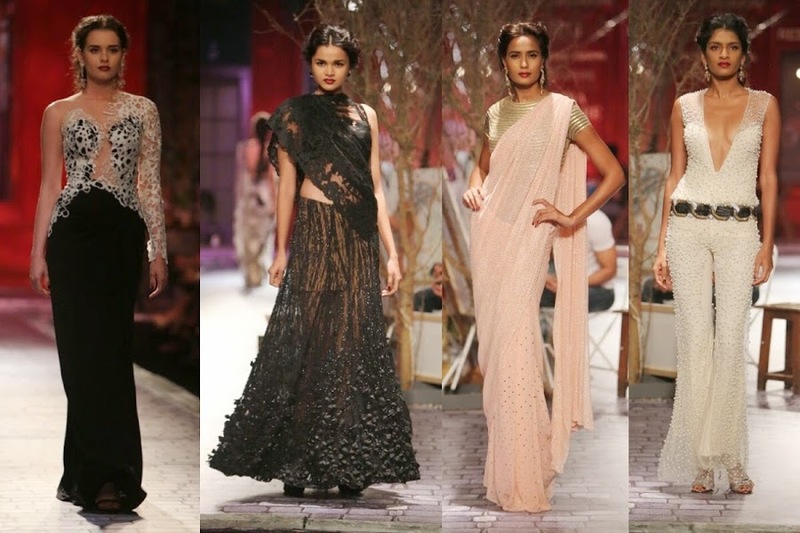 Guess we just gave a big fat blow to the Indian taboo of wearing black for weddings ! Monisha Jaising is India’s eminent fashion designer and founder of the brand ‘Monisha Jaising’. Currently her multi-dimensional label comprises of luxury sportswear, resort wear, evening wear and bridal couture. Known as the princess of “Bohemiam luxe” and the “Inventor of the Kurti”, she completes 25 glorious years in the fashion industry.